I don't remember. As the month has creeped towards this date, I have tried to remember anything other than the few scraps that run through my mind. I have nothing. I was in first grade. In 4 days, it would be my 7th birthday. In 6 days, it would be Thanksgiving. There was much to be excited about. He would be shot at 12:30 and pronounced dead 30 minutes later. The school day began, I think, around 8:30, with lunch being taken in staggered shifts starting at 11:00. We got out at 3:00 p.m. and, because I lived on a farm, had to find my school bus to take me home. I don't remember any announcement and, if there was one, would I have understood what was being said? I do remember getting out of school early that day. It was chilly and overcast. At that time, girls had to wear dresses or skirts to school. Boys, even farm boys, were not allowed to wear jeans. I have a memory of a red and blue plaid dress, a brand new dress, sent to me by my grandmother for me to wear before my birthday. I think I was wearing it that day. That's the impression I have. I remember stone-faced adults helping us onto our busses for an early ride home. I remember, vaguely, a stone-faced bus driver, a normally jovial fellow, not saying, "Hello" as he usually did when we got on the bus. I'm sure the behavior change was unnoticed by me. I have no recollection of my parents' reaction when I arrived home. I remember being angry the next day, because the usual Saturday morning cartoons, which my brother and I were allowed to watch in our pajamas while eating a bowl of cereal in the living room, were pre-empted for some stuff. There were all these talking heads, all these men, in hushed, deliberate tones, talking about something bad happening. What it was, I didn't know. I am very certain the television would have been on when Jack Ruby assassinated Lee Harvey Oswald. I have no memory of seeing it. Perhaps we weren't allowed to watch TV that day. Most likely, we didn't care about the talking heads and went elsewhere to eat breakfast and to play. My sister was almost 10 months old, too, and probably crawling all over. If my parents wept over this, they didn't do it in front of us. I have a vague memory of a funeral cortege, the black horses and the men without hats following solemnly behind it, walking for a long ways. There is a memory of an image of a flag-draped coffin. I see the video of John saluting his father's coffin and I do remember seeing that. I don't know if we had school the next week. Perhaps it was cancelled on Monday, as that was the day of the funeral and this new medium, television, was going to bring that event into people's homes. I don't remember school the day before Thanksgiving so that would have left just Tuesday for classes. My feeling is that we didn't go to school until the following week. I also don't have any memory of my birthday or Thanksgiving of that year. Did we celebrate either event or did the trauma of the assassination of a president, something we were suddenly privy to, diminish all degree of happiness? I don't remember. I think Oswald acted alone. I do not think there was a second shooter. Leaders of countries tend to be targets for people who want to make a name of themselves or who assign blame for the ills of their life or who think they will bring about whatever change they have latched onto. There tends to be a mental instability about the person doing the plotting. Although John Wilkes Booth had a small group of like-minded people supporting him, he was not a part of a grand, over-arching plot to destabilize and change the government. I think the same is true of Oswald. I also think we like to wrap our heads around the idea of a conspiracy because one man, acting on his own thoughts, couldn't plan this, couldn't execute it. We had a young man with a beautiful wife, two delightful children, and a glamor that equaled any royalty anywhere else. Never mind the rumors of infidelity. Never mind the wheeling and dealing. Never mind bringing the world to the brink of nuclear war. We liked the outward sheen. To have that so violently taken from us by one man, we can't get our heads around it. Was Oswald influenced by things? Of course he was, just as any person is. His beliefs governed his actions. He probably blamed President Kennedy for some ill we don't know of, real or imaginary. I don't think he was coerced or directed by someone else to fire those shots, nor do I think there was anyone other than him with a gun aimed at the president. In his mind, removing Kennedy was the only rational step to take. I find the conspiracy theories interesting and we should always question what we know, but we should also accept that we will never, ever know, for sure, why. 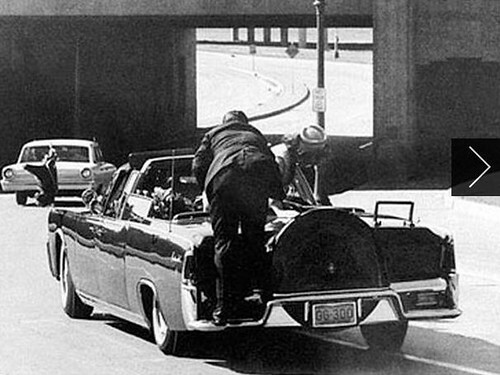 The answer to that question died on November 23rd when Jack Ruby shot Oswald. We changed that day, all of us. There's a before November 22, 1963 and an after. Nine presidents prior to Kennedy had attempts made on their life. Three of those attempts were successful. The events surrounding these attempts were covered extensively, but we didn't see them unfold before us. We read about it the next day or, in the middle of the last century, heard about it on the radio. Here, we saw things as they were happening. The immediacy of this television medium allowed us to be angry together, to grieve together. For a few days, 50 years ago, we were united in a way we'd never been before. Kennedy's death was, I believe, the start of our desire to know and for media to bring everything to us. That is the biggest change.